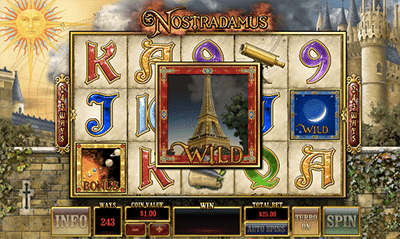 If you’re looking for a pokie without paylines and a 16th century French theme, you might want to try Nostradamus Prophecy. This 243 Ways to Win title by Playtech is based on the French apothecary, Nostradamus with a medieval theme to fit. There are quite a few features to this pokie too, so the ways to win format isn’t the only exciting part to it and we detail these below. 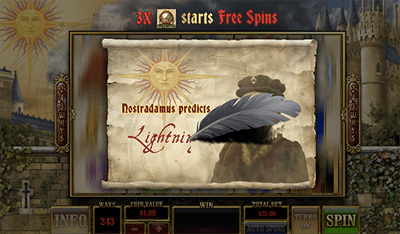 Nostradamus Prophecy is a 5 reel, 3 row, and 243 ways to win pokie set on a backdrop featuring a castle, a sun, and other detailing which takes us to medieval times. Since the title is based on the French philosopher who predicted various events in history the title follows his prophecies. When you first open the pokie you are treated to a short introductory video and then to the screen detailing the bonuses on offer. Once you click ‘continue’ you will be taken to the reels. The graphics are bright and done well with animations on the title and the spin button, as well as the symbols on a win, giving life to the reels. The coin sizes range from 0.01 to 2.00, while the minimum bet is $0.25 and the maximum is $50.00. You can adjust your bet size by clicking the plus or minus symbol under the coin size button. The spin button, the option to play in ‘Turbo Mode’ (a speedier version) and the bet size are all found under the reels, too. There’s a medieval soundtrack attached too – perhaps something you would hear when strolling around a 16th century French castle – but you can mute the audio in the top right hand corner. Additionally, the RTP for Nostradamus Prophecy is 94.00%. The symbols are crafted well, though Playtech – or Ash Gaming since they created the title and Playtech re-released it under their name – have included the A, K, Q, J, 10, and 9 symbols to represent the lower payouts. The highest payout you can get with these symbols is 70 coins by spinning five A symbols. The middle value symbols are represented by the scroll, the sand timer, the telescope and the book, with the highest payout of 300 coins won by spinning five books. The highest paying symbols include both Nostradamus himself plus the Wild symbols, with both offering 500 coins if you spin five of a kind. The Wild symbol is the crescent moon and substitutes for all symbols except the Scatter – which is the globe (triggers the free spins bonus). Other symbols you should keep an eye out for include the Bonus symbol which is the planets and only appears on reels 1, 3, and 5, plus special reel modifiers added during the Free Spins feature represented by the Earthquake, Lightning and Tsunami symbols. You can click on the ‘Info’ button to view the payouts, plus what each symbol does, which is located in the bottom left of the game screen. 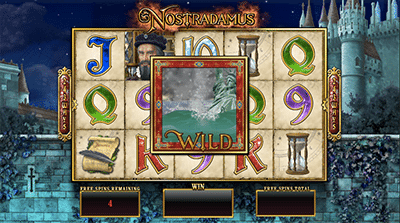 There’s quite a few bonus features on offer on Nostradamus, with one triggered at random in the base game. The Planets Bonus is triggered by landing three Bonus symbols. Here the screen will transform to planets spinning around the sun at various speeds. If they stop on the Win Line you will be awarded a random multiplier. As you can see there’s plenty of features to the pokie by Playtech. The graphics have been done well and while the minimum bet is $0.25 this is still quite suitable for most player’s bankrolls. There’s plenty of features to keep you entertained too, with an expanding type feature offered with the Nostradamus Predictions Bonus. When this activated randomly during gameplay we were awarded with the Lightning Reel Modifier, and the animations of lightening bolts added extra Wilds to our reels. While there isn’t a whole heap of free spins – and to get as many as possible you need to spin five Scatters – the reel modifiers mean big wins. Additionally, Turbo Mode speeds up gameplay immensely – so opt for this if you aren’t very patient for the outcome. You can find Nostradamus Prophecy at SlotsMillion.com where you can opt in for the $100 matched deposit welcome bonus for new players.